This is OASE economy range. The components are of good quality, but the pumps that come with these systems do not have a huge flow rate, so they are not suitable for ponds with large fish or ponds that require the filter system to be hooked up to a waterfall. Having said that, they are great for ponds with small to medium fish up to 1000 litres maximum (with small fish only). 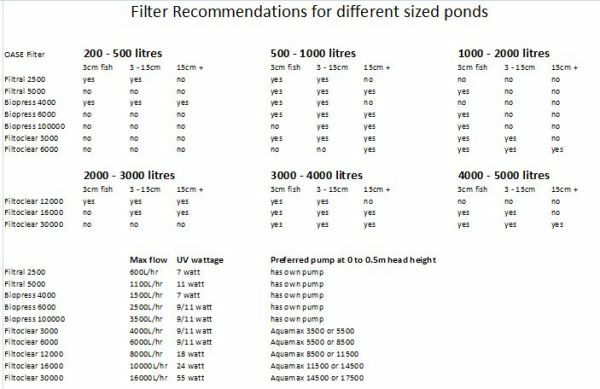 For ponds approaching 2000 litres, you should consider a Filtoclear 6000 or Filtoclear 12000 if you have large fish. This pressure filter sets consist of one Biopress pressure filter each, with integrated UVC and a matching filter/ watercourse pump with all necessary hose connections for quick assembly. You're reviewing:OASE Biopress 10000 pump and pond filter set + 2 FREE 11w UV Globes worth $49.90!